We had the best night on Friday. We went to the Dance Mix 95 party at the Cabin. T he Cabin is NOT a place I would normally go¹ but this was a ticketed special event. 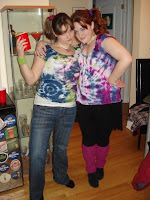 The theme was obviously the 90s, and we put a lot of thought into our costumes. 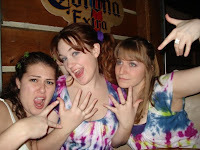 We bought white tshirts and tie-dyed them on Wednesday night. I bought magenta leg warmers, scrunchies and had my parents bring over my converses. The night went really well. Needless to say we all got really drunk, as we have a tendency to do.² They played the best music. Britney.³ Spice Girls. Backstreet Boys. Cotton-eyed Joe. It was awesome. We danced all night. And I wasn’t even too hungover for work the next day. Anyway. These pics are the result. I have such a good time going out with my girls! ¹ The only other time I’ve been was years ago. I was not impressed, the floors were sticky. ² Especially this month. Every single weekend. ³ From back when she was entertaining, if not good. a) Love love loooooove the new design. So fun and you! b) Ew sticky floors. But I’m glad it was a good time! 1) scrunchies provide an easy and quick alternative to actually doing your hair. 2) Tie dye matches everything! 3) Leg warmers are, well, warm. 4) Blue eye shadow blurs the line between trashy and beautiful. Who doesn’t want to be a little more trashy beautiful? 5) You will attract pink power rangers. 6) Bright colors make you want to drink more. haha. That was an awesome night.